To have a house that we call our own is a dream of every Filipino. But it is not easy for everyone to have a house in the Philippines especially if income is not enough. Many of us are a Pag-IBIG member but not all member has given an opportunity to have a housing loan. Sometimes we asked ourselves, as a member of Pag-IBIG, is my contribution enough for me to be qualified to have a housing loan? "Am I qualified for Pag-IBIG Housing Loan?" This is a common question we always heard when we are planning to apply for a housing loan. The Pag-IBIG Fund allows its members to borrow a maximum loanable amount up to P6 million pesos and is subject to certain conditions. For instance, the maximum amount a member can borrow depends upon his actual need and capacity to pay. The interest rate will also depend on the loaned amount, but will not exceed a maximum of 11 percent per year. Your eligibility for Pag-IBIG Housing Loan will be determined in four things - your membership and contribution status as a Pag-IBIG member; your age; your capacity to pay; and your other or existing Pag-IBIG loans. 1. Your Pag-IBIG membership and contributions. 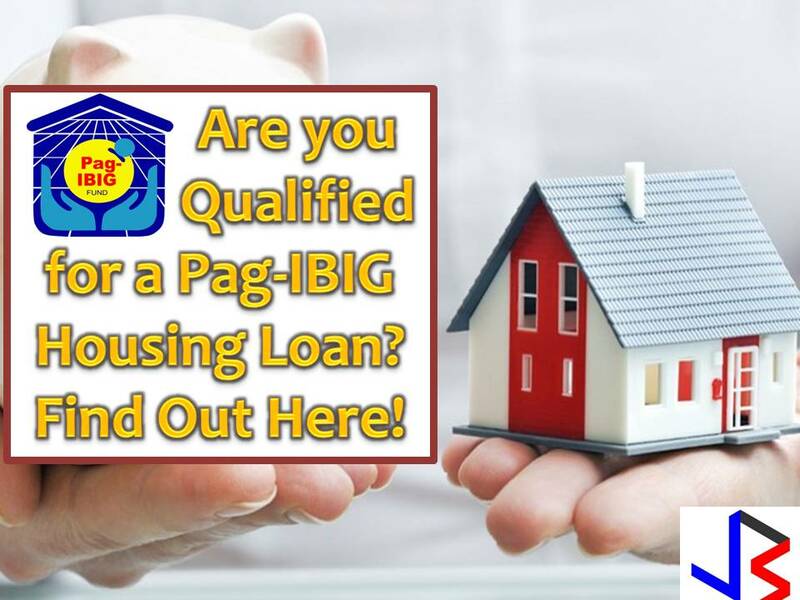 In order for you to be qualified in Pag-IBIG Housing Loan Program, you must be an active member of Pag-IBIG for at least two years and has contributed a minimum of 24 monthly contributions. Both the principal borrowers are subject to the above-mentioned requirements. Up to three Pag-IBIG Members may avail of a single housing loan provided they are related within the second civil degree of consanguinity. It means, the three members can apply to finance the same property as long as they are related to each other until second degree by blood (ex: parents, siblings or by law (spouses). Others may ask is if it is possible to pay 24-months one-time and then avail of Pag-IBIG Loan immediately? Sad to say, this rule is a thing of the past, under the Pag-IBIG Law of 2009, you may still pay 24-months one-time but you need to wait for another 24 months to apply but there are branches that allow only 12 months waiting period. If you can afford to have a housing loan, it is an advantage if you apply at a young age so that you will have longer years to pay in a small amount. According to the Pag-IBIG Fund Primer on Housing Loan, a member's loan entitlement shall be limited to an amount for which monthly repayment on principal and interest shall not exceed 40% of the member's net disposable income. It means the monthly amortization should be less than 40 percent of your net disposable income. 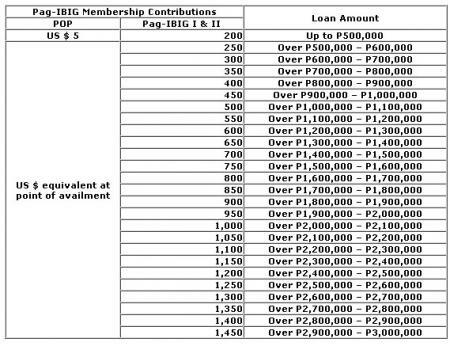 Looking at the table, in order to get a loan amounting P1,000,000, your contribution should be P450 pesos per month. It is important to have savings for your housing down payment or equity, so make your finances in order. You need to show your proof of income too such as payslip, income statements, the employment contract with indicated salary etc. If your income is insufficient, take a relative (within the second degree of consanguinity) or your spouse and tuck-in your contributions the apply for a housing loan. You are only allowed to one Housing Loan at a time. Existing housing loan should be paid first before taking another one. If you already availed of the Pag-Ibig Housing Loan before make sure it was not foreclosed, canceled, bought back, or subjected to dancion en pago or giving back of the property mortgage to the lender in exchange for the discharge of a mortgage debt. Payments must be updated for those who have an outstanding Multi-purpose loan. READ: Do You Know How to Apply for Pag-IBIG Short Term Loan?